Last week I posted a blog article about the Autodesk Innovation Genome. 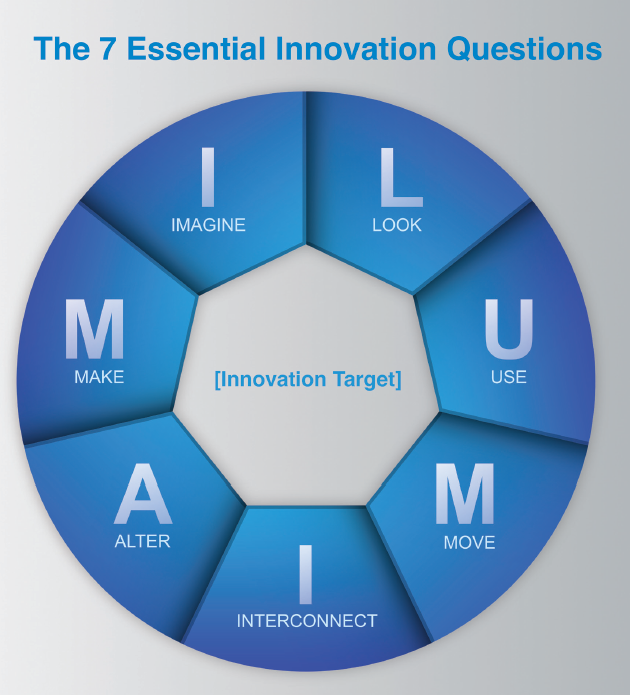 "How Studying Past Innovations Revealed 7 Questions that Can Lead to Future Innovations"
That article covered how our innovation Strategist, Bill O'Connor, came up with 7 questions whose answers often lead to innovations, types of innovations, and how to pick an innovation target. 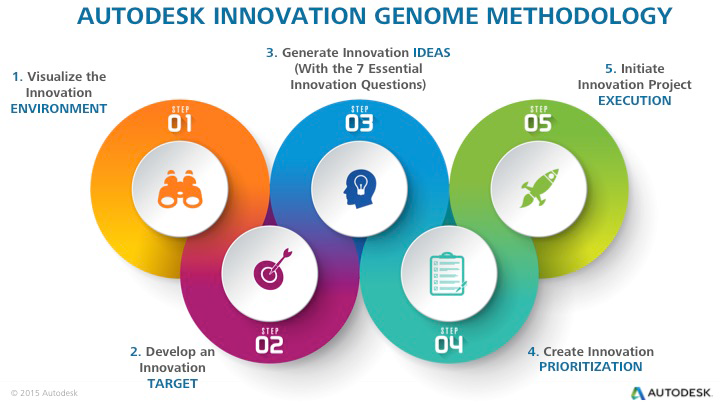 Actually, the Autodesk Innovation genome is one of our methods in an overall innovation process. I had this documented on the Autodesk Labs site when we were collecting feedback on the process, so as a follow-up to last week's blog posting, I thought I would dust it off. The Autodesk Innovation Genome is a research project and innovation methodology being developed at Autodesk/San Francisco. The goal of this research project is to develop a comprehensive innovation methodology comprised of new innovation techniques that are both powerful and practical. The purpose is to help people and organizations create real innovations that positively impact their organizations and the world. These innovation techniques — that are currently being used at Autodesk, by dozens of Autodesk customers, across Silicon Valley, and in 12+ countries around the world — are derived from an ongoing 10-year research project that systematically examines the greatest 1,000 innovations in human history over the past 3.4 million years. We start with the stone hand axe (the world's first innovation), study great innovations across history (like democracy and the printing press), and continue up to current day innovations such as the Internet, microfinance, and the Tesla. To date, we have studied 350 innovations. Building on this extensive research, Autodesk has identified a previously undiscovered set of common characteristics among all true innovations — a kind of "Innovation DNA" — that has led to the creation of new innovation techniques. They are easy to learn, teach, and apply, even in organizations that have traditionally been relatively non-innovative; and they have proven extremely effective for both experienced innovators and people with minimal innovation expertise. Innovations come from a five-step process. What impact do we want to have? Two things to consider are the type of innovation desired and where technology exists on the innovation continuum. With an innovation target developed, the next step is to brainstorm using a structured process. Autodesk has found that a simple set of seven questions were at the heart of many of these innovations and that these questions could be applied to any project or idea to make it more innovative. 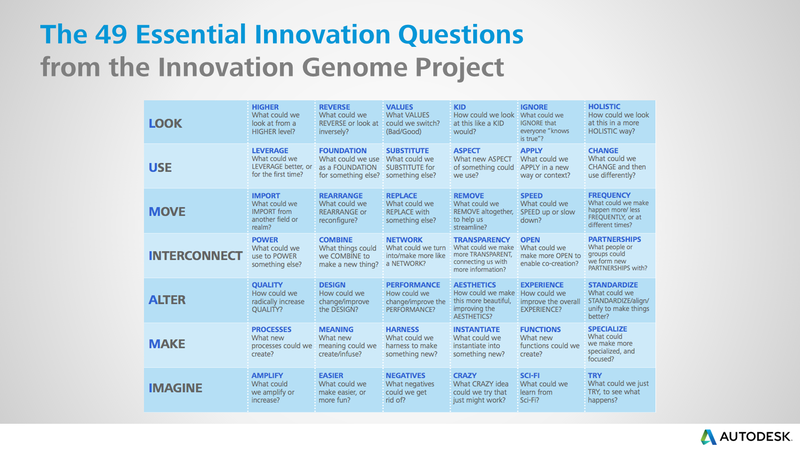 Answering these questions generates ideas that lead to innovations. What could we look at in a new way? What could we use in a new way, or for the first time? What could we move, changing its position in space or time? What could we interconnect, for the first time or in a new way? What could we alter, in terms of design and performance? What can we make that is truly new? What can we imagine that would create a great experience for someone? An easy way to remember these questions is to use the acronym LUMIAMI for Look, Use, Move, Interconnect, Alter, Make, and Imagine. In the event that even more ideas are desired, consider 49 questions. With a set of ideas in hand, the next step is to prioritize them based on how "wild" and how "worldly" they are. The wild rating is based on impact. 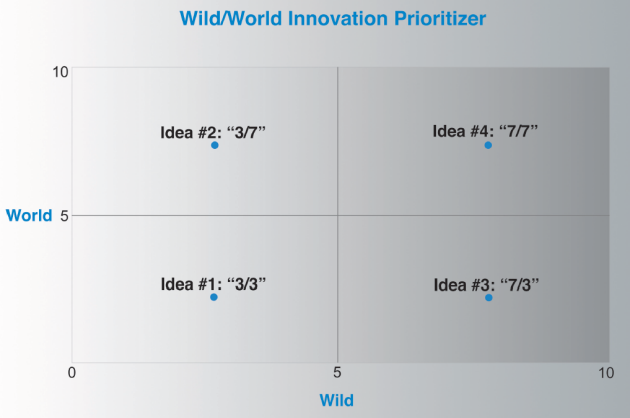 The wildest ideas have the most impact (from 0 to 10). The world rating reflects the ability to implement. The ideas that are easiest to implement have the highest rating (from 0 to 10). Idea #1 — Rated as a 3/3, this idea has limited impact and is somewhat difficult to implement. Ideas in the lower left quadrant are to be avoided. Idea #2 — Rated as a 3/7, this idea has limited impact but is rather easy to implement. It may be possible to use this idea as an innovation target and come up with variants that could make it more impactful while retaining or improving its ease of implementation. Idea #3 — Rated as a 7/3, this idea has significant impact but is somewhat difficult to implement. It may be possible to use this idea as an innovation target and come up with variants that could make it easier to implement while retaining or improving its impact. Idea #4 — Rated as a 7/7, this idea has significant impact and is also easy to implement. Ideas in the upper right quadrant are the ones to implement right away. Once a subset of ideas that are impactful and easy to implement have been identified, it is time to execute them. In many situations, a seven-step process is the road to success. Brilliant Description — Precise thinking begets precise language. Having separate one sentence, one paragraph, and one-page descriptions of a proposed innovation allows everyone to have the same understanding independent of the amount of information stakeholders can digest. Thought Experiment — As a thought experiment, identify all of the positive outcomes if the innovation were to come to pass. Threat Assessment — Identify all of the potential threats. Often these come from people in the organization who may be adversely impacted by the innovation. Create plans to mitigate the threats. Boss Approval — Sell the idea using the brilliant description and the thought experiment. Show that all bases are covered by going over the threat assessment. Make sure the boss is on board. Iteration/Improvement — Plan for continuous improvement even before launch. Finalization/Launch — With only one chance to make a first impression, make the initial launch count. Ongoing Innovation — Plan to revisit the topic and select new innovation targets based on the changing business landscape. And that's one of the ways it's done at Autodesk. A path to innovation is alive in the lab.